Emojis have come a long way from their start as shorthand for emotions to their current status as cultural powerhouses with their own movie franchise and merchandise. Now the San Francisco Museum of Modern Art is tapping into our obsession with these ubiquitous tiny images to spread the joy of art. Emojis first appeared in 1998 when Japanese mobile communication professional Shigetaka Kurita developed them as a way to send a message without using a lot of data. Over the next decade, they became increasingly popular around the world, especially after Apple introduced them to its iOS and Mac OS X 10.7 systems. In 2010, Unicode standardized the emoji characters, sparking the mainstream cultural phenomenon that exists today. In response to the rise of emojis, and as a means to celebrate art (especially the 17,000 works it has indexed online), the San Francisco Museum of Modern Art (SFMOMA) kicked off a new promotion campaign called "Send ME SFMOMA." The way it works is simple. Just text the phrase "send me," along with an emoji of your choice, to the number 57251. The museum responds with a relevant piece of art along with details such as the artist's name and the year of its creation. It also works if you text a phrase like, "Send me something yellow," but part of the fun is seeing what the program thinks relates to images. For example, a text with a diamond ring emoji came back with an antique image of horses in the ring at a rodeo. The "Send Me SFMOMA," campaign has had a great response since its launch. In the first few days alone, the museum received over 2 million texts. While there isn't a match for every single emoji (for example, the alien head, since there is no alien image in the collection), they are finding that when a search does comes up empty, users will look for something else. 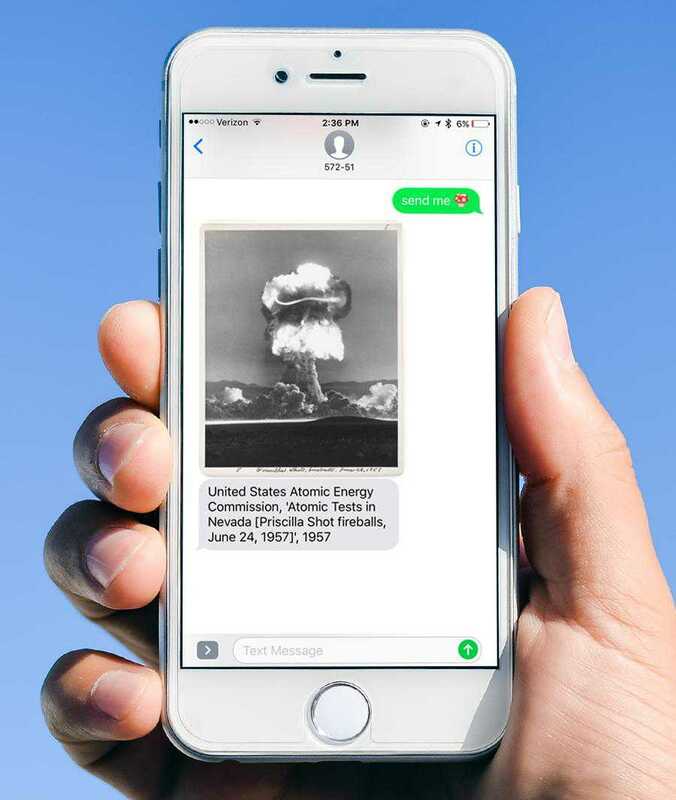 The project has prompted conversations about art, and has opened the eyes of the museum's staff to the moods and desires of their audiences (for example, they have received more texts requesting happy or positive images than negative). "Send Me SFMOMA" could appear like a one-off, but it seems more than likely that other museums and institutions could be inspired to use text technology to share their collections and foster conversation among their audiences, too. And since SFMOMA's code is completely open source, the next textable collection could be right around the corner!